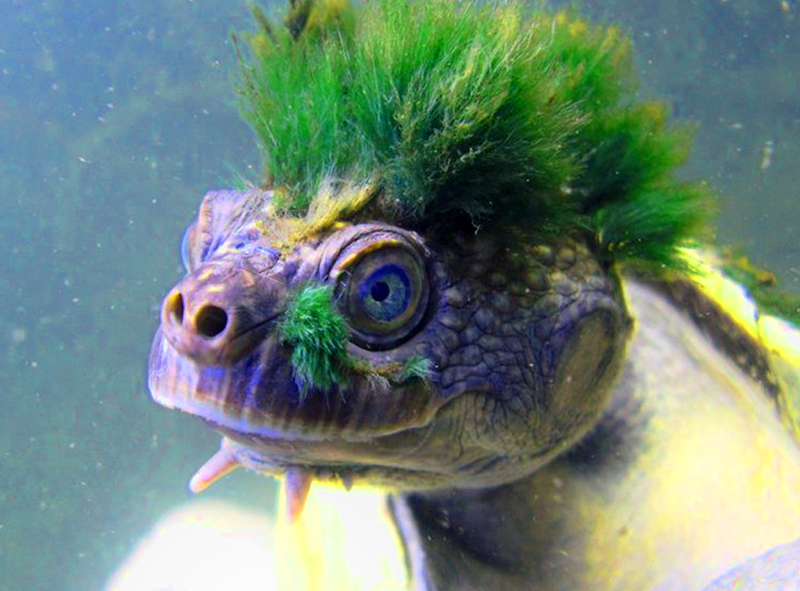 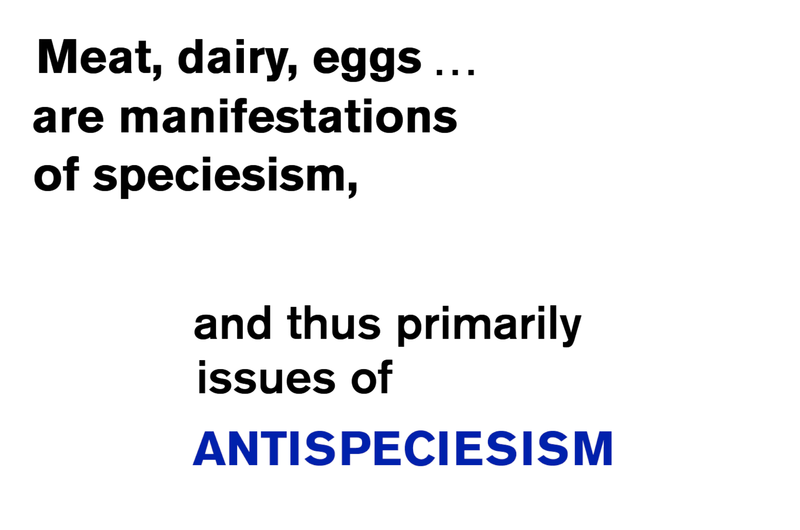 The missing discussion of specifics of nonhuman oppression, in its exact manifestations as humiliation, degradation, negation, violence is currently a hinderance of further development in the political efficacy of the “Animal Rights movement”. 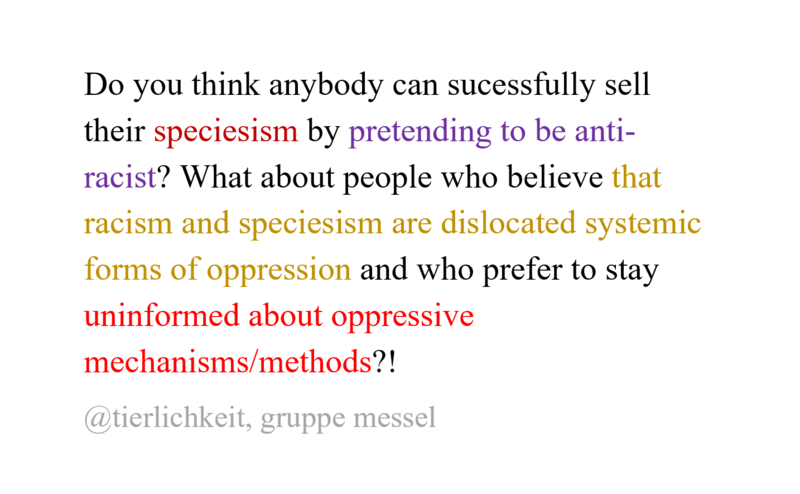 interrelated oppressive systems > how is it to be specifically “food” e.g. 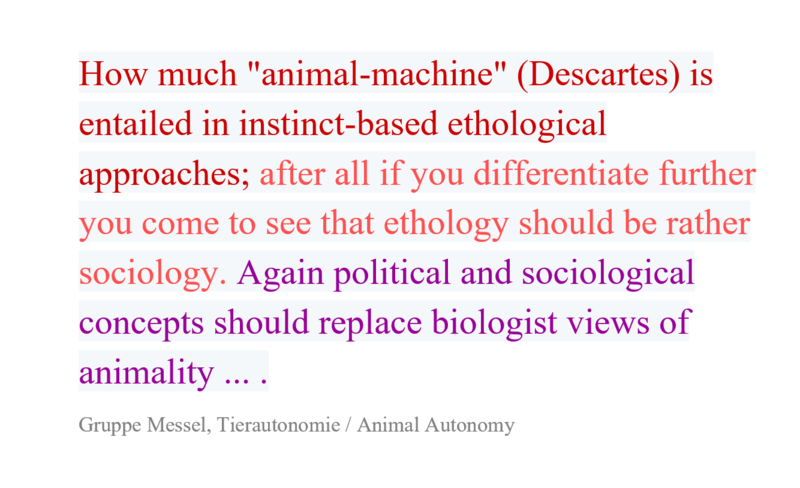 Contextualizing animality within the broadest possible fields seems to be necessary, in order to create an adequacy in perspective on sociological, ecological, philosophical e.g. 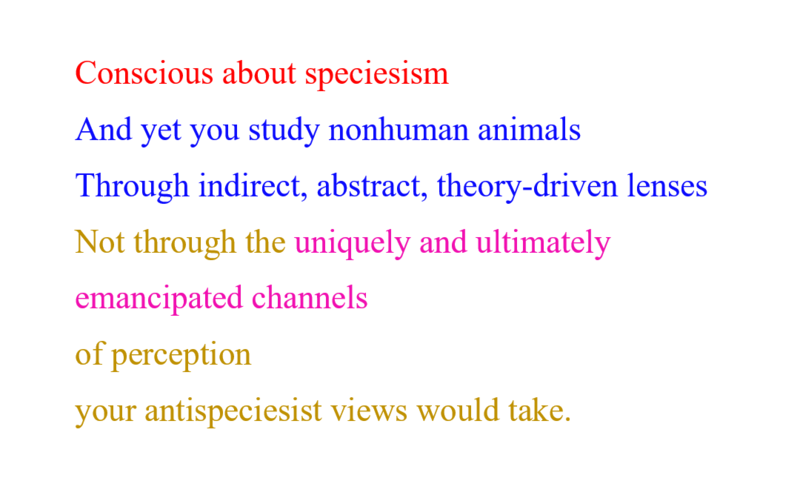 parameters and qualificators of the nonhuman situation as faced with speciesist oppression. 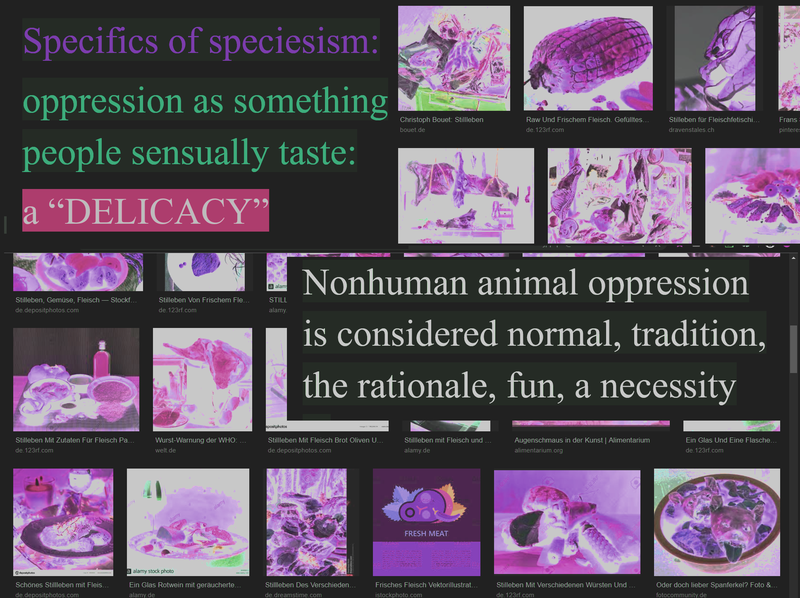 Specifics of oppression in speciesism: I am taking aesthetics as this is the most overlooked field of problem within the Animal Rights movement considering the powerfulness aesthetics hold in human societies and the specifics of speciesism and aesthetics as an oppressive tool. 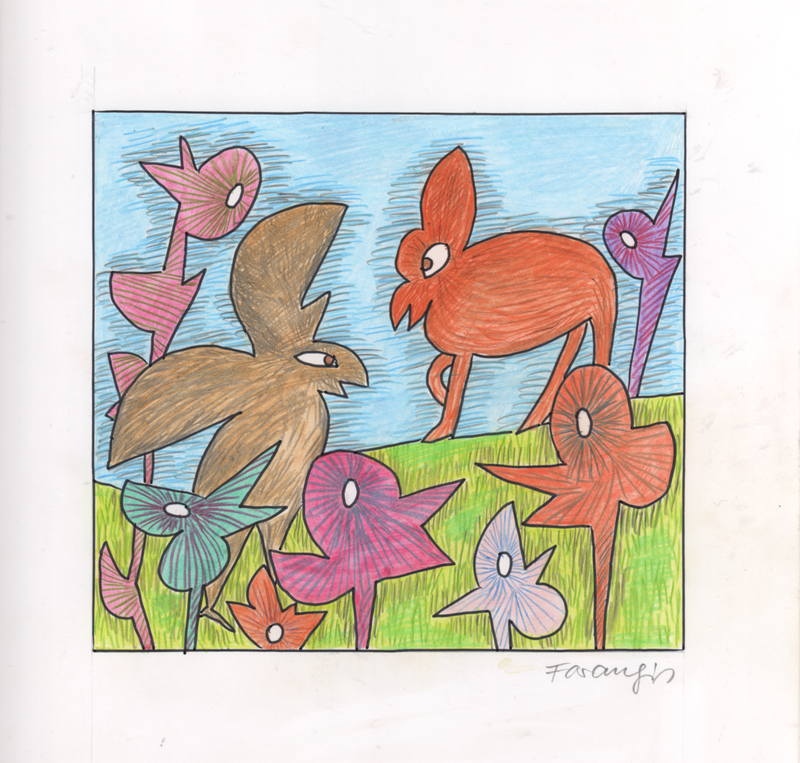 Aesthetics in arts is one way in which animal degradation takes form. 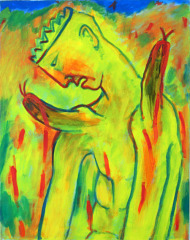 In which ways does this occur? 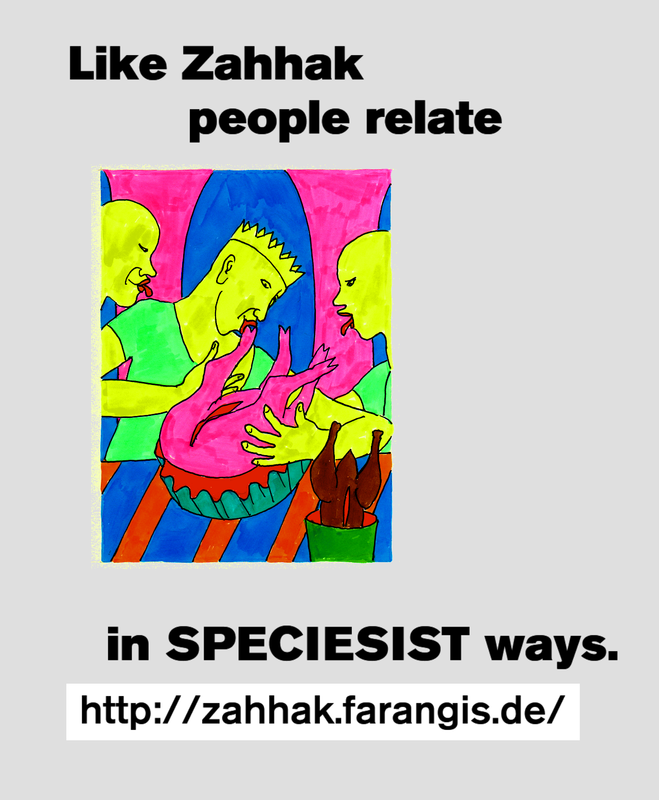 The exact ‘speciality’ of speciesist and/or nonhuman derogative aesthetics can be observed. 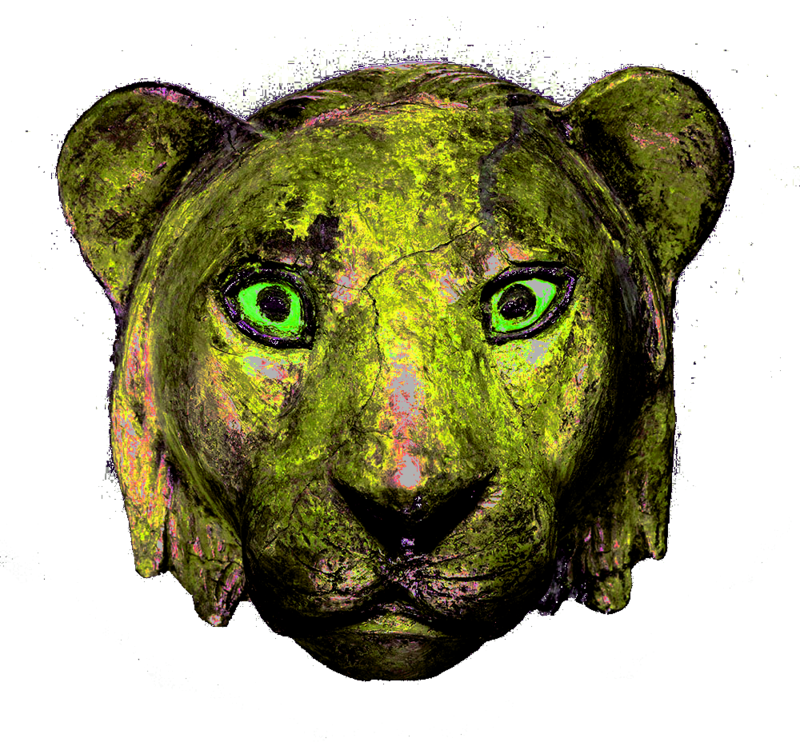 What makes up aesthetics in its cultural function overall. 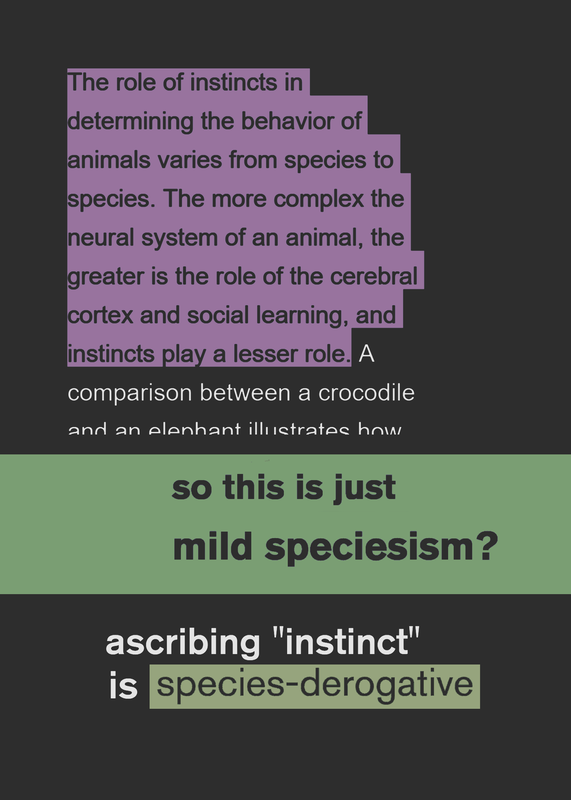 The central roles have to be considered which wilfulness (Willkür), taste/preference (Geschmack, Präferenz), mode (Machart), subjectiveness play. 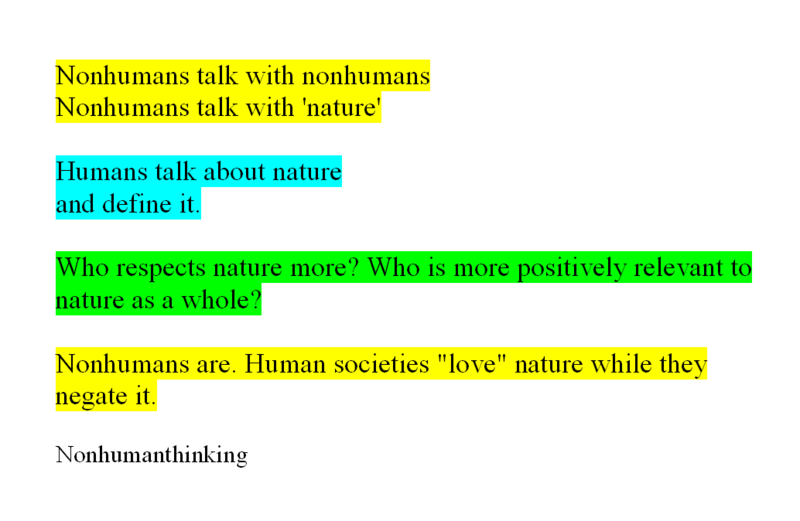 “Thinking experiences” (Denkerfahrungen) of nonhumanity must be taken into account > multiplication with the perspectives of nonhuman others on the basis of e.g. 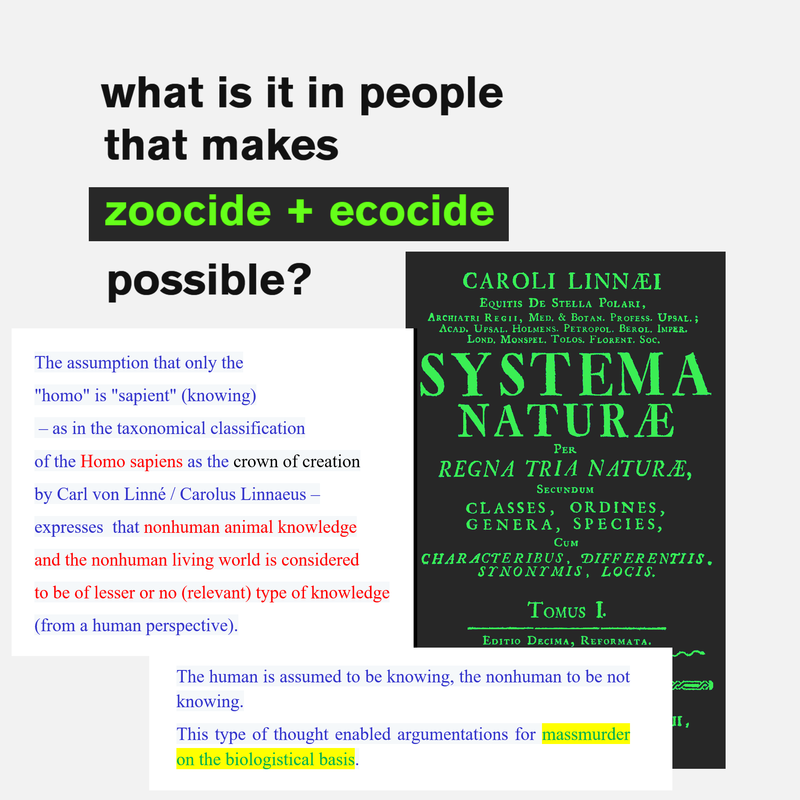 the shared fact of individual existence and individuality – leaving difference and don’t require sameness (this is my posulation), yet locate “life” in “one world” (…). 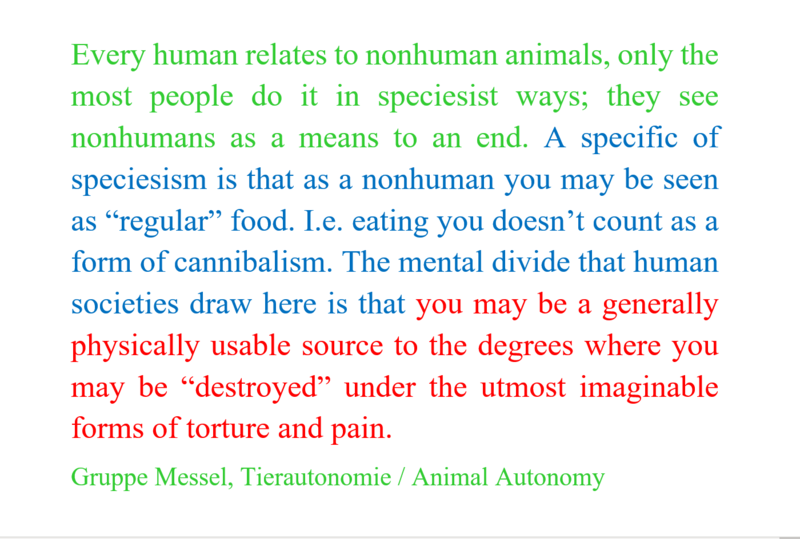 If we exclude nonhumanness again from all possibilities of angles of narration and narrative, we keep on repeating and perpetuating the initial species-denouncing act.